"Matta's first contribution to Surrealist painting, and the most important, was the discovery of regions of space until then unknown in the field of art." "I am interested only in the unknown and I work for my own astonishment." In 1997 it has become clear that for more than a half-century Matta has been painting the state of consciousness we would reach by the millennium. Virtual reality, cyberspace, the World Wide Web, the invisible communications network that daily shrinks the globe, an electronic "information age" that forces our awareness into ever more complex multilayered modes all contribute to a system of interconnectedness that Matta has been making visible since he exchanged his drafting tools for a paintbrush in 1937. A modern day Leonardo, he has refused the designation of painter, preferring montreur, one who makes known, and much as Leonardo sought to draw the invisible -- air currents and gravitational pulls -- Matta has tried to give form, not to what we see, but to the multitude of environmental forces that simultaneously act on us. For Matta art and science march with the same step; as early as 1943 he suggested that Einstein had opened as many doors for art as Freud. The drawings and paintings from Matta's first two decades that comprise the present exhibition demonstrate that his vision has been consistent from the start. They also enable one to trace the steps through which he proceeded to respond to the challenge he had set for himself. This is how he defined that challenge in mid-career: "If we admit that we are entering a new world in which there are laws that we do not understand, in such a world it is the task of the poet and the artist to represent this new physics where we must now live and which is revolutionary." "Painting has one foot in architecture and one foot in the dream." Matta's words pinpoint the crossroads at which the young artist stood in 1937. Trained in architecture and interior design in his native Chile, he was employed as a draftsman by Le Corbusier during the mid-1930s, working most of the time on the visionary drawings of the Ville Radieuse while making his own forays into visionary drawing. During a visit to relatives in Spain he met Federico Garcia Lorca who gave him a note of introduction to Dalí, but it wasn't until he heard of Lorca's murder by the Falangists that he actually called on Dalí. Matta made contact with the surrealist group when Dalí suggested that he take his drawings to André Breton who was eager for young recruits who might prevent hardening of the surrealist arteries. Breton recognized in the drawings that here was someone who did indeed have one foot in the dream and asked how he could tolerate the coldly rational field of architecture. Matta joined the surrealists in time to exhibit in the major international exhibition that opened in Paris in January 1938, albeit with his own visionary turn of mind firmly established. Because Matta moved sideways into art, he had the advantage of not having to unlearn a conventional art training, as well as of having acquired in architecture a command of complex systems of spatial rendering. Years later he was still proclaiming that he was not a painter, but one who makes visible, believing that "art is to see" and its function is "to unveil the enormous economic, cultural and emotional forces that materially interact in our lives and that constitute the real space where we live." Everything means something in Matta's art, but to penetrate its mysteries one is obliged to ignore conventional questions of influences and categories -- even the label surrealist applies only insofar as surrealism was a liberating force. His approach to drawing and painting coincided with surrealist automatism, but the ends to which his use of automatism was directed were quite different. According to Matta: "Automatism is a method of reading 'live' the actual function of thinking at the same speed as the matter we are thinking of, to read at the speed of events, to grasp unconscious material functioning in our memory with the tools at our disposal. Automatism means that the irrational and the rational are running parallel and can send sparks into each other and light the common road." Surrealism, then, offered him validation and a support system, but he and his cohorts, Gordon Onslow Ford and Esteban Frances, were little concerned with the Freudian researches of an earlier generation and represented instead a transforming force in this last pre-war avant garde. In 1937 when he and Onslow Ford met, Matta had not yet begun to paint, but he was drawing in pencil and crayon, giving visual form to the unseen by using as a starting point both microphotographs of plants (Untitled, 1937) and the models constructed to demonstrate Poincare's mathematical theories, photographed by Man Ray for Cahiers d'Art (Star Travel, 1938). Improvising freely from the close-up photographs of flowers and plants enabled him to suggest a morphology of growth, that is, following a form through the various phases of its evolution, rather than seeing it frozen in a single state. He believed that since the eye can see only a section of reality, the artist should use morphology to give a fuller view. Similarly the Poincaré models provided clues for the visualization of a non-Euclidian space through the use of warped planes. To break the confines of a space conceived as a cube has been Matta's ongoing preoccupation. "I was trying," he explained, "to get into a space where all the ordinates and coordinates are moving in themselves because the references to the wall of space are constantly changing. One can't reproduce any more what happens in a Euclidian cube." In 1938 Matta and Onslow Ford spent a rainy summer in Brittany, reading and discussing Ouspensky and other visionary writers each morning before starting to paint. Both were profoundly affected by the Russian visionary's concept of the world of sight as a prison and the artist as a clairvoyant who "must see that which others do not see and must possess the gift of making others see what they do not see by themselves." Up to this point Matta had worked mainly on paper in colored pencil and crayon. That summer with some urging from Onslow Ford he tried oil paint on canvas, sweeping a rather dry brush over an opaque dark ground to produce the hallucinatory painting, Crucifiction, which has been explained as combining images of Christ and Mary and as the residue of Matta's strict Jesuit upbringing. Soon he was applying paint more boldly, squeezing it directly from the tube onto the canvas and spreading it with a palette knife, cloth, or brush to produce a flowing, undulating effect. There followed a series of works he called morphologies, including Morphology of Desire which Onslow Ford described as containing what Matta considered the four essential elements: on the right an embryonic landscape and a black stone, on the left a personage, and in the center an architectural construction. When Breton expressed bewilderment, Matta wrote his well-known definition of psychological morphology as "the graphic result of the adaptation of internal energies to obstacles created by the environment... The conception of a psychological time medium in which objects are transformed leads one to compare it to a Euclidian space in rotary and pulsatory transformation." When Matta arrived in New York in 1939 two months after the start of World War II, the art dealer Julien Levy was so impressed by the work that the then unknown artist showed him that he gave him his first solo exhibition the following spring. 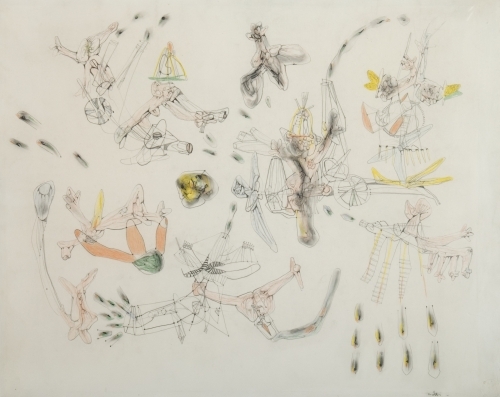 At the time he was doing cryptic drawings such as Woman Playing with a Ball in Front of a Volcano, 1940, or the two Untitled 1940 works reproduced here. One of the latter is in what might be termed his "flayed figure" style and depicts an execution, the executioner's hat suggesting a member of Franco's fascist guard. The paintings of 1940-41 developed along the lines of the "morphologies," becoming richer in color and more complex in structure and frequently referring to what appear to be cataclysmic phenomena. By 1941 when he spent the summer in Mexico and painted Theorie de l'Arbre a "volcanic" style had evolved which was to culminate in the magnificent The Earth is a Man of 1942. Having grown up in the geologically active region of Santiago (the name Chile comes from an Indian word which means there where the earth ends, there where the abyss begins), Matta must have felt in Mexico the reverberation of something long familiar which caused his canvases to fill with upheavals of the earth and rock-spewing volcanoes. "I saw everything in flames," he recollected, "but from a metaphysical point of view. I was speaking from beyond the volcano. The light was not a surface, but an interior fire... I painted that which burned in me and the best image of my body was the volcano." Also related to the volcanic series is Foeu, 1941, its title a combination of feu (fire) and fou (mad). The delicate linear structures that were scarcely visible in previous paintings play a larger role here as they would continue to do in the paintings of 1941 to 1943 such as Locus Solus or Years of Fear. Using these multiperspectival transparent structures in combination with opaque planes and translucent washes Matta created spaces that seemed to break the time barrier in the sense that they represented simultaneously many places and many points in time, thus fulfilling his dictum that "reality can only be represented in a state of perpetual transformation." These paintings stunned New York audiences; the more perspicacious critics raved, museums and collectors bought, and one young editor wrote; "If you ask me who is the most talked about painter in town I would say it was Matta." During the winter of 1942-3 a group of younger American painters, including William Baziotes, Robert Motherwell, and Jackson Pollock, met in Matta's studio to experiment with automatism and to explore possible new directions involving extrasensory perception. He was, as Sidney Janis wrote, "an irrepressible young artist of talent and temperament," a "fuse that lit up the New York scene." In an Untitled crayon and pencil drawing of 1942 tetrahedrons suspended in space or attached to long rods are introduced and they reappear as opaque black shapes in a number of 1943 paintings. These remind one of the metal cutouts Matta must have seen suspended in Alexander Calder's studio barn during his many weekend visits to those of the émigrés who had settled in the vicinity of the Calder home in Roxbury, Connecticut. Matta was also friendly with Katherine Dreier who had Marcel Duchamp's Large Glass in her living room until it went on view at the Museum of Modern Art in 1943. In the 1942-43 drawings there are frequent notations of revolving forms and mechanisms like those in the Large Glass, the seeds of a suite of Duchampian paintings that led to The Bachelors Twenty Years After of 1944. Then came a drastic turn in Matta's work, represented here by Figure Studies, 1946, a change which lost him a large portion of his New York following. Into this seductive, engulfing spaces intruded tubular humanoids in a variety of contorted positions. It was, according to the artist, a heightened awareness of the horrors of the war and the revelations of the Holocaust that prompted the change. "Instead of my personal psychological morphologies I tried to develop a social morphology using totemic images." There are many contemporary sources for these quasi-mechanical creatures with bizarre extrusions from their "heads," including Giacometti's Invisible Object, the plaster of which Matta had just purchased, the elongated spirit beings in Wifredo Lam's Jungle, Hopi Kachinas which he collected, and his 1942 efforts to give visual form to Breton's Great Transparents. The name he coined for them, "vitreur," with its implication of transparency gives particular credence to this last connection. His newly populated spaces became even more explosive as he painted them on an ever larger scale, enmeshing his mechanomorphs in repeating linear circuits that suggest the dynamics of interconnection through invisible energies. He began to stress the dehumanizing effects both of technology and social organization in drawings such as Insurance Policy, 1951, in which the figures are deployed like automatons in a complex structure that suggests the state or a corporation. Some of these drawings with flyspeck humans are studies for his large 1951 paintings, among them Les Roses Sont Belles which refers to Julius and Ethel Rosenberg who were executed as convicted wartime spies during the McCarthy era. Matta's canvases of the 1950's seem to alternate between paranoid visions of technology run amuck such as The Violence of Machines, 1953 and more tender visions of regeneration in the natural world, represented here by Untitled, 1952. Or he may fuse both in a single work as he does in Hills a Poppin, 1953, where the suggested landscape appears to become a battleground bristling with weaponry and distant anti-aircraft guns, as if living in Italy, as he did, he could hear the echoes of World War II. However, it is counterproductive to try to interpret these canvases too literally, because one risks missing some of their layered implications. Matta's vision encompasses many layers of time and space and takes into account electromagnetic fields and interplanetary connections; his scale is cosmic, yet his images are often plausibly concrete. Turning of the Earth, 1955, is a spatial tour de force which takes us into the red-hot molten center of the planet where gearshifts, paddles and a central pivot seem to form a hub which drives our daily rotation; for a moment one is aware of the speed at which we spin through the "minimum of reality that we use in our half-sleep way of life." Geste Incarnate, 1958, with its effulgent light and flickers of iridescent color is the embodiment of what Matta calls "the light gun of painting." If this light gun, he hypothesized in 1963, "could bombard the mind from the inside and the outside, spreading out the emotional structure and illuminating it totally, we could begin to see how, when, and where emotions act and react; we could grasp reality... Human energy is a system in expansion in a universe and the real is made of oscillations, waves, beams; a world is a nexus of vibrations." The protean canvases, up to ninety feet in length, that Matta has painted in the last half-century have been possible because he works with prodigious energy and at tremendous speed in order to keep ahead of conscious thought. What emerges is a direct transmission of preconscious experience that cannot be adequately verbalized except perhaps in poetic terms. Breton held that it was surrealism's mission to change consciousness in order to change society. It has been Matta's function to outrun the accelerating tempo of change in contemporary consciousness in order to make visible the reality, inner and outer, in which we now exist.